Peanut butter and jelly is the classic school lunch standby. Most parents keep bread and a jar of each on hand at all times. While there is certainly nothing wrong with sticking to tradition, it can get overstated from time to time. 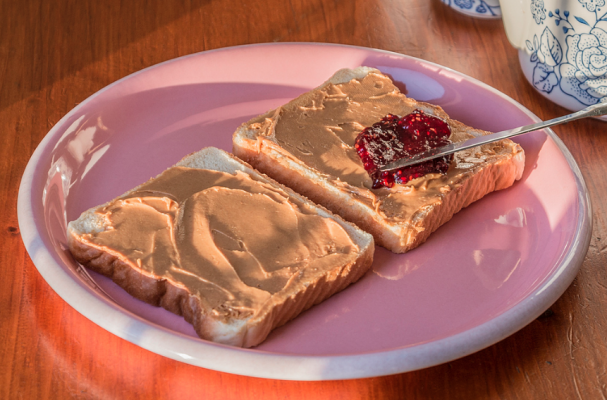 To ensure your kids don't get tired, here are five ways to upgrade PB&J. 1. Use real fruit jam instead of jelly. Your kids might protest, initially, but even they won't be able to deny the vast difference between the two spreads. Jam adds texture and incredible flavor. These days you can pick up good quality preserves at your local supermarket or even something more exotic like blood orange berry marmalade or fig raspberry jam. I will even add fresh fruit when I have it on hand. 2. Two butters are better than one. The well-known food writer Ruth Reichl advises spreading some softened butter on the bread prior to adding the peanut butter. Once the sandwich is made, microwave it for 8 seconds to help all the ingredients melt together into one delicious gooey mess. 3. Bacon makes everything better. Bacon has become a universal flavoring agent that adds an irresistible smoky salty bite to anything it touches. Your kids may be wary of the combination but one bite will have them convinced that bacon is always a good thing. 4. Take turns. Peanut butter is obviously the king of the PB&J sandwich but that other nut butters and non-nut butters can't be in the spotlight every once in awhile. This trick becomes especially important for those kids who have a peanut allergy. Some peanut butter alternatives include almond butter, cashew butter, sunflower spread, tahini and coconut butter. 5. Share the spread. I like to incorporate other spreads into my peanut butter and jelly sandwiches - think Nutella, marshmallow fluff, or biscoff (cookie butter). While they may not be the most nutritious choice, they sure do taste good slapped between two slices of bread.